Music • Hell-raising band set to play two sold-out shows. 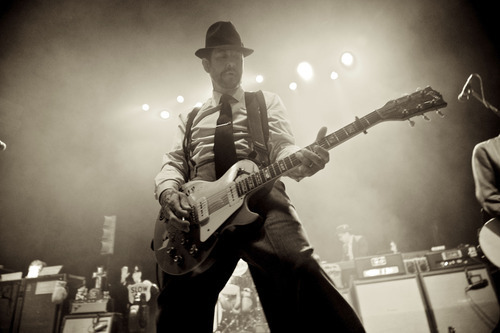 Can you believe that Social Distortion frontman Mike Ness is 50 years old? Ness can, and he's happy about it.
" is the new 30," Ness said in an interview. "I box four to five times a week. I'm in a better place than when I was 30, spiritually and emotionally. It's like a fresh start. What can I do over the next 50 years?" Let's hope his next 50 years are anything like his last. The hell-raiser began the Southern California rock band when he was only 16. While the nascent band tried to thrash as much as its punk idols in the latter part of the 1970s, childhood influences of listening to country and rockabilly on the radio always crept up into his music until he gave up trying to resist them. It was on the pompadoured band's seminal 1990 self-titled album that Social D debuted its revved-up rendition of Johnny Cash's "Ring of Fire." And over the course of the four albums that followed, Ness essentially had "punk" tattooed on one hand and "Buck" (as in Owens) on the other, working together to create alt-country before the genre had a label. The guitars will be as loud as ever at Social D's two sold-out shows at The Depot, but for those two nights the venue will be a honky-tonk. 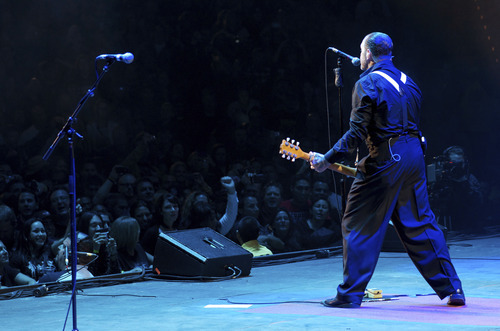 Ness is the only remaining member of the band, but Social D has always been his band. In 2011, he released "Hard Times & Nursery Rhymes," a hard-edged collection of songs that celebrate the kind of outlaws who frequent the back alleys and rural roads that country singers reference. It even included a song named after Buck Owens' hometown, "Bakersfield" (though Bakersfield residents would object to its less-than-flattering characterization, while former residents would see it as the truth). You want songs about junkies, winos, pimps and whores? Just listen to Ness' first single off his 2011 album, "Machine Gun Blues." But with 50 still being 50, Ness said his plans for his next album are to "shock everyone and release it in a timely fashion." The reason? "I don't like to take it for granted that fans will stick around. We had some big gaps between albums." So, even as the recording for "Hard Times & Nursery Rhymes" was being finished, Ness "left the creative door open" and continued to write. "We've got a great start on the record," he said. "It's a good place to be." But we shouldn't get ahead of ourselves. This summer, he plans on spending times with his kids and writing for another solo album. Writing for the next Social Distortion album won't begin in earnest until January, Ness estimated. Wait, Ness has kids? Yes, two. And befitting a man who is 50, Ness said he told his son not to get any tattoos. (Ness was 17 and drunk when he got his first tat, and now most of his body is inked.) But in the end, the effort was futile. "What can I say?" he said. "That was like trying to keep the sun from coming up." So when his son turned 17 and told his father he was going to get a tattoo from someone Ness had never heard of, the father took it upon himself to drive his son to a reputable tattoo parlor. Social D's opener is Lindi Ortega, who is cut from a similar cloth as Ness when it comes to outlaw country but says she "never was into the punk world until this tour." She added: "I'm so grateful that it's opened itself for me." Originally from Toronto, Ortega now lives in Tennessee, but earlier this year she was nominated for two Juno Awards, New Artist of the Year and Roots & Traditional Album: Solo, awards considered the Canadian equivalent of the Grammy Awards. Ortega grew up in household filled with LPs of Waylon Jennings, Merle Haggard and Kris Kristofferson. "I feel like I'm influenced by outlaw country, and it shares the similarities with punk." It wasn't until she went to a Sonic Youth show in high school that Ortega picked up a guitar. Since then, she has made ends meet by doing some gigs with The Killers' lead singer (and former Utah resident), Brandon Flowers, singing backup for him during his solo tour. "I knew after that I didn't want to be a backing singer." Social Distortion with Lindi Ortega. When • Friday and Saturday, May 11 and 12, at 8 p.m.